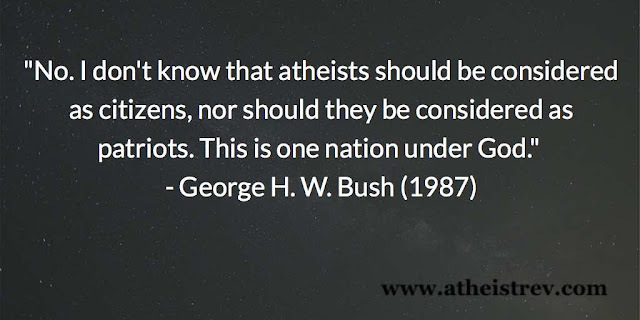 It would not be accurate to say that this alleged quote from President George H. W. Bush was the reason I started writing Atheist Revolution; however, I did include it in the first post I wrote back in February of 2005. It would be fair to say that the idea of an elected official saying something even remotely close to that pissed me off back then. It still has that effect when I hear someone holding or seeking public office say something similar. I suppose bigotry tends to have that effect. We've heard even worse sentiments expressed by all sorts of politicians since then. But yeah, this is one of the things I'll probably associate with Bush that doesn't involve Dana Carvey. Even if he didn't say these words, this sounds like something he or many others like him would have said. Bigotry seems to be part of the human condition. It has been with us from the beginning, and it will likely persist until our demise. It changes form in the sense that a group once subjected to widespread bigotry can reach the point where little bigotry toward them is evident (e.g., Catholics). Bigotry directed at some groups has become much less socially acceptable over time (e.g., LGBT persons), while bigotry toward other groups has persisted with relatively little change. Sadly, I'd put atheists in this second group. Anti-atheist bigotry is still quite prevalent and does not carry the same stigma as bigotry aimed at many other groups. If humanity can persist into the future without succumbing to the effects of climate change or other catastrophes of our own making, a point may be reached where god-belief subsides below the 50% mark. Reaching that point would be a milestone because it would indicate that a majority of humans had progressed beyond one ancient superstition. It is very unlikely that we'd then see bigotry aimed at what would be a majority of the population. The interesting question is how close we have to get to that point - without actually reaching it - before anti-atheist bigotry becomes socially unacceptable in the way many other types of bigotry have. Nothing I've written here should be read as suggesting that any form of bigotry has disappeared entirely. I don't think that's the case. We can pick almost any example we'd like of a group that was historically subjected to widespread bigotry, and we'd probably be able to find pockets of bigotry directed at that group today. And so, just because bigotry against one group becomes socially unacceptable does not mean our work is done. But I have to think that when we find a group of people against whom bigotry is still widespread and socially acceptable, it might make sense to pay them some attention. Is it fair that the above statement is what I will probably remember most about Bush? Probably not. First, some have questioned whether he even made the statement. Second, even if he did say it, it probably isn't fair to reduce any person to a few sentences. And yet, I am tempted to remember him as someone who was elected to represent all Americans but had trouble looking past his religious beliefs. He wasn't the first to do so, and he won't be the last. That's what I find most troubling: there is a legacy of anti-atheist bigotry even if it does not belong to Bush.